Yet for all their brave endeavours, it was not these Victorian action men but one of the humble Christian missionaries who arrved in Africa at about the same time who became the first European to set eyes on Kilimanjaro. Johannes Rebmann was a young Swiss-German missionary who arrived in Mombasa in 1846 with an umbrella, a suitcase and a heart full of Christian zeal. 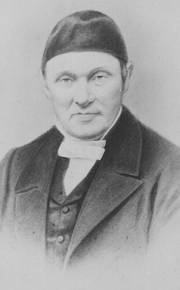 His brief was to help Dr Johann Ludwig Krapf, a doctor of divinity from Tubingen, in his efforts to spread the Christian faith among East Africa’s heathen. Krapf was something of a veteran in the missionary field, having previously worked for the London-based Church Missionary Society in Abyssinia. Following the closure of that mission, Krapf sailed down the East African coast to Zanzibar and from there to Mombasa, where he hoped to found a new mission and continue his evangelical work. Instead, his life fell apart. His wife succumbed to malaria and died on the 9 July 1884. His daughter, born just three days previously, died five days after the death of her mother from the same disease, while Krapf too fell gravely ill with the same; and though he alone recovered, throughout the rest of his life he suffered from sporadic attacks that would lay him low for weeks at a time. But though his body grew weak with malaria, his spirit remained strong, and over the next six months following the death of his wife, Krapf both translated the New Testament into Swahili and devised a plan for spreading the gospel throughout the interior of Africa. Estimating that the continent could be crossed on foot from east to west in a matter of 900 hours, Krapf believed that establishing a chain of missions at intervals of one hundred hours right across the continent, each staffed by six ‘messengers of peace’, would be the best way to promulgate the Christian religion on the dark continent. Unfortunately for Krapf, Islam had got there first, which made his job rather tougher; indeed, in the six months following his arrival in Mombasa, the total number of successful conversions made by Krapf stood at zero. Clearly, if the faith was to make any inroads in Africa, fresh impetus was required. That impetus was provided by the arrival of Rebmann in 1846. Having recovered from the obligatory bout of malaria that all but wiped him out for his first month in Africa, Rebmann set about helping Krapf to establish a new mission at Rabai-mpia (New Rabai), just outside Mombasa. The station lay in the heart of Wanika territory, a tribe who from the first had proved resistant to conversion. Even the founding of a mission in their midst did little to persuade the Wanika to listen to Krapf’s preaching: by 1859, 14 years after Krapf first arrived, just seven converts had been made. It was clear early on that they would have little success in persuading the Wanika to convert. So from almost the start the proselyting pair began to look to pastures new to find potential members for their flock. In 1847 they founded a second mission station at Mt Kasigau, three days’ walk from Rabai-mpia – the first in their proposed chain of such stations across the African continent – and later that same year they began to plan the establishment of the next link, at a place called Jagga (now spelt Chagga). Rebmann and Krapf had already heard a lot about Jagga from the caravan leaders who earned their money transferring goods between the interior and the markets on the eastern shore, and who often called into Rabai-mpia on the way. A source of and market for slaves, Jagga was renowned locally for suffering from extremely cold temperatures at times, a reputation that led Krapf to deduce that Jagga was probably at a much higher altitude than the lands that surrounded it. This hypothesis was confirmed by renowned caravan leader Bwana Kheri, who spoke to Krapf of a great mountain called ‘Kilimansharo’ (this, incidentally, being the sixth definite reference to Kilimanjaro). From other sources, Krapf and Rebmann also learnt that the mountain was protected by evil spirits (known in the Islamic faith as djinns) who had been responsible for many deaths, and that it was crowned with a strange white substance that resembled silver, but which the locals simply called ‘cold’. Here we are in the midst of African heathenism, among wilful liars and trickish men, who desire only our property… The only earthly friend whom I have, and whom he has, does at once disappear, each of us setting our face towards our respective destinations while our friends at home do not know where we are, whither we go and what we are doing.